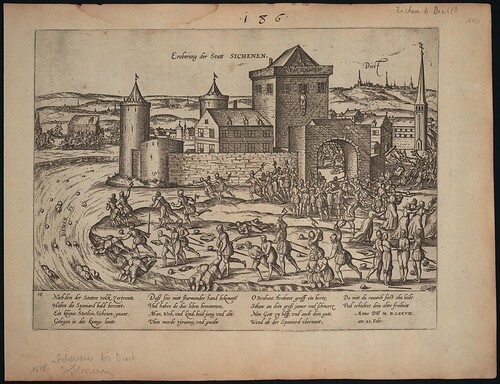 The images below are essentially a random sampling from a suite of more than 150 engraved prints depicting events of the 80 Years War (or 'Dutch Revolt') made by the Hogenberg family over a forty year period. 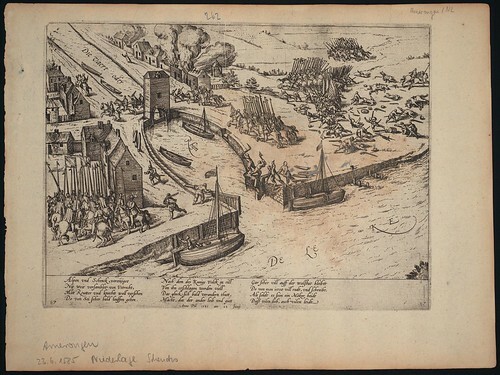 "The Battle of Oosterweel took place on March 13, 1567, and is traditionally seen as the beginning of the Eighty Years' War. 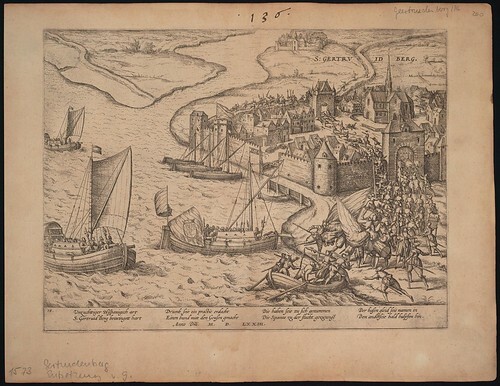 The battle was fought near the village of Oosterweel, north of Antwerp*. 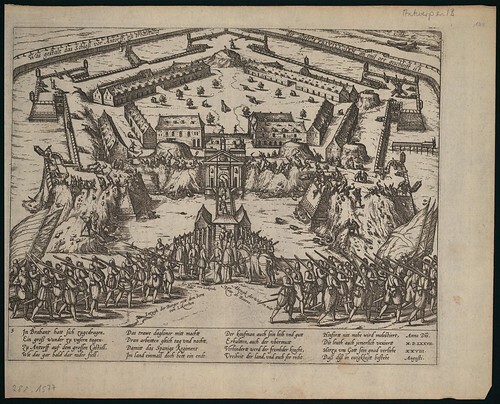 A Spanish professional army under General Beauvoir defeated an army of radical Calvinists rebels under Jan de Marnix. The prisoners were considered rebels and all were killed. Some 700-800 Protestants died. 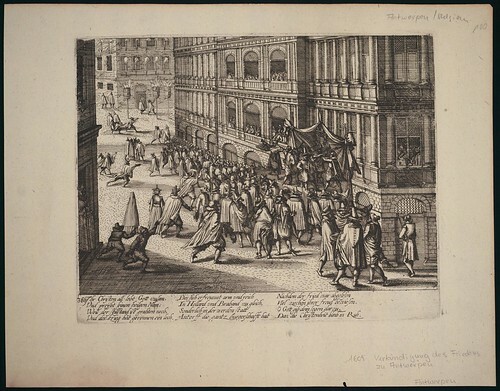 William the Silent, the Burggraaf of Antwerp, did not allow the Protestants of the city to come to their aid, because he, as lord of the city, was bound by oath to support the Spanish king." 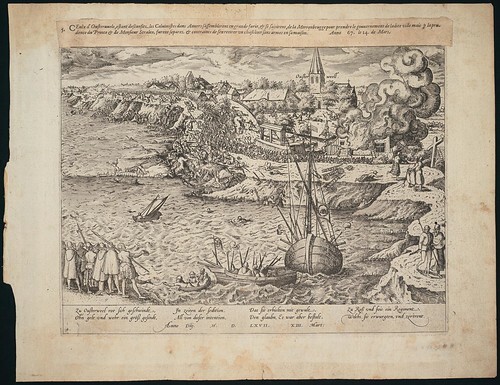 "The Siege of Chartres in February to March 1568 was the pivotal event which ended the Second War of Religion, an episode of the French Wars of Religion. 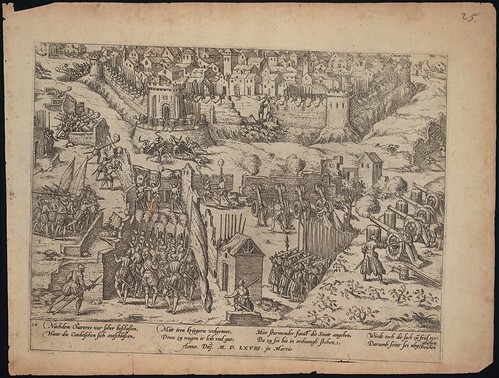 The Huguenot army besieged the town at the end of February. The Prince of Condé had five battering cannons and four light culverins. Part of the army acted as block and the rest, about 9,000 men, encircled the town and used their nine guns to breach the north wall. 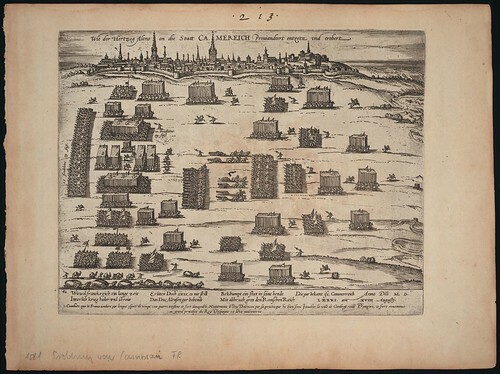 The Huguenots assaulted the town on March 7, but the Royal garrison of Nicolas des Essars, assisted by inhabitants defended stoutly. The assault was repelled and the breach sealed off. The Duke of Alba (Alva), carried out the brutal repression of Protestants in the Netherlands from 1567 to 1573 at the behest of Spanish King Philip II. 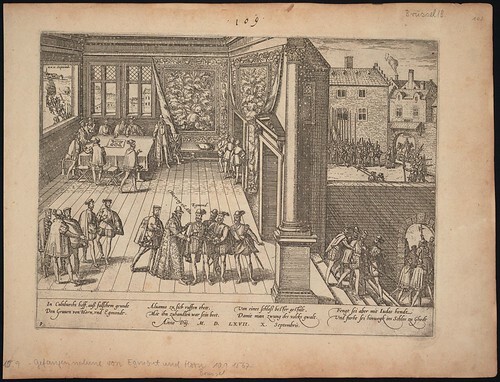 The Duke ordered the arrest, torture at the hands of the Inquisition and subsequent beheading of the two most important noblemen in the country, Counts Egmont and Hoorn. They became martyrs and figureheads of the resistance. 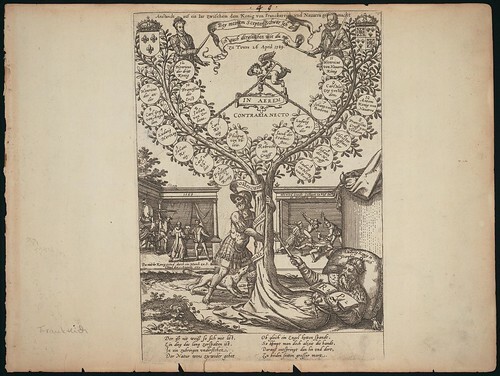 The two branches atop the tree refers to the truce agreed on 26 April 1589 between King Henri III of France and the Huguenot Henry of Navarre, so that their forces could be combined against the Catholic League. 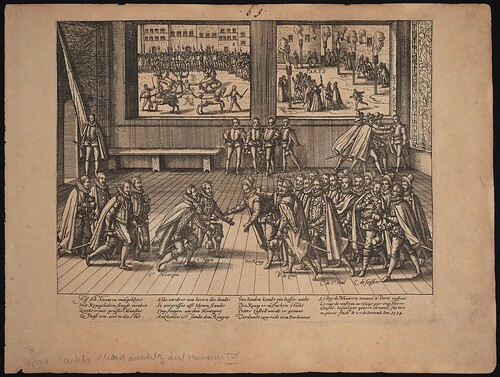 The print also shows the assassination of Henri III in August of 1589 by a Dominican friar. Henry of Navarre succeeded as Henri IV, King of France and Navarre. 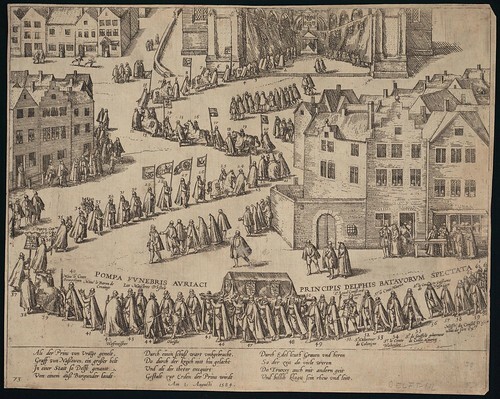 The highly detailed engravings were produced by Franz Hogenberg and his son Abraham between 1570 and 1610 in Cologne. The elder engraver/publisher most famously contributed to the enormous Braun 'Cities of the Earth' book. 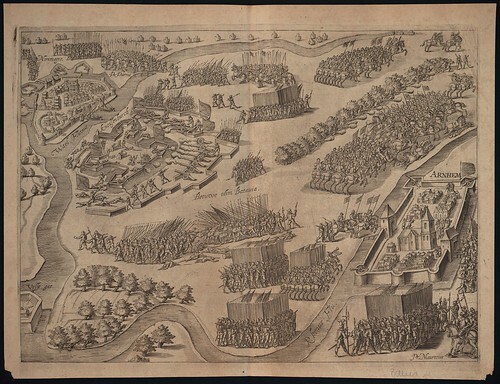 The Hogenberg prints of the 80 Years War are available among the Digital Collections of the Princeton University Library [link updated Oct. 2012]. The vast majority of text on the prints is in German, but there's a smattering of French and Dutch as well. 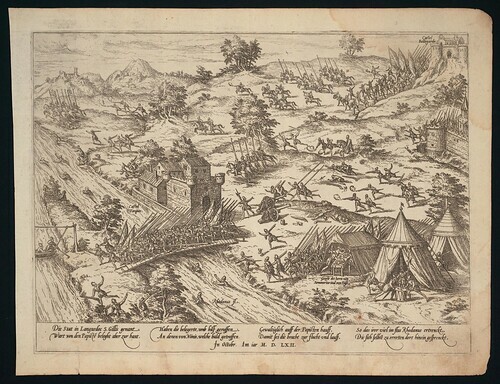 Wikimedia has a selection of images pertaining to the 80 Years War including some of the Hogenberg suite from Rotterdam's Museum Boijmans Van Beuningen. Google's cache of a detailed 80 Years War timeline. Some biographic background to the Hogenbergs. Thanks very much to Nina Stössingert for the help with translations. Dear Peacay ,Congratulations on this awesome post ! I am big a fan since a discovered your blog! this princeton collection? Can you help me out? Thanks Michel. Perhaps you can email me about this: peacay --> gmail. There's something a bit too cavalier or provocative about publically sharing out this sort of info. I have mixed feelings of course but I hope to walk a fine line that keeps me/this in the good, or at least tolerant, graces of the cultural custodians. Sorry for the belated response, I just ran across your post here while searching the Dutch Revolt. These images are very fine, thanks for sharing them (although apparently the link to the rest no longer working). Very nice blog you have here, a booklover's delight. 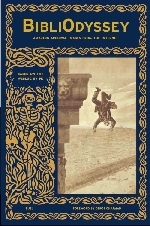 Thanks Steve, I've updated the links to the Hogenburg Engravings Collection at PUDL above. Thanks very much, peacay. I can access them now.